Even though I am a Muslim, I cried bitterly for the dead Israeli athletes. They were the sons for whom fathers had endured torture, and for whom the sea had split, leading them to a refuge away from the Pharaoh. I felt affinity for the Israeli athletes. They were made of the muscle of Haifa and the bone of Tel Aviv, as I was of the blood of Bhopal. They were a father's aspirations and a mother's hope. Only, unlike them, I was still alive. hirty six years after my father played for India in the 1936 Berlin Olympics under the captaincy of Dhyan Chand, both myself and Ashok Kumar, son of Dhyan Chand, were selected to represent India in the 1972 Munich Olympics. But there was a catch. 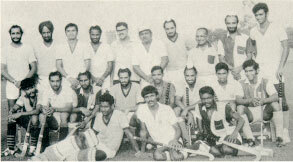 While Dhyan Chand's son was played in the Olympics, Ahmed Sher Khan's son sat twiddling his thumbs on the sidelines. In the friendly matches before the Olympics, I think I played well. But I had a gut feeling that full backs Mukhbain Singh and Michael Kindo would be played in the Olympics. In the semi-final against Pakistan, Mukhbain Singh missed 17 penalty corners in the match - a dubious world record. India's defeat was inevitable. We lost 0-2. K. N. Mohlajee would write later in the Junior Statesman, "Aslam Sher Khan went to Munich only to twiddle his thumbs on the sidelines. If the IHF could not 'trust' him, why was he taken at all? Aslam, whose father represented India in the Olympics, could have been tried as a left-half, as his natural bent is aggression." While our defeat in the semi-finals was tragic, what happened in the Olympic Village was worse. It has gone down as the most dastardly act in the history of sports. All the teams, including India and Israel, were housed in alphabetical order in the Olympic Village. Suddenly, from next door, the clatter of machine guns was heard. The aftermath was the blood-drenched bodies of 11 Israeli athletes. The acrid smoke of cordite and gunpowder choked the village to silence. The Palestinians, instead of wielding the gun, could have learnt to excel on the playground and then refused the medals on the rostrum. America's black athletes had done it in the previous Olympic Games. Even though I am a Muslim, I cried bitterly for the Israeli athletes. They were the race on which God had bestowed his beauty. They were the sons for whom fathers had endured torture, and for whom the sea had split, leading them to a refuge away from the Pharaoh. I felt affinity for the dead Israeli athletes. They were built of the muscle of Haifa and the bone of Tel Aviv, like I was built of the blood of Bhopal. They were a father's aspirations and a mother's hope. Only, unlike them, I was still alive.